DETROIT -- Clad in dark jeans and a denim jacket, looking a bit like a biker, Mike Simcoe spent a sunny Michigan afternoon recently looking over dozens of classic British motorcycles. He strolled past all the great names -- Vincent, Matchless, Triumph, Norton, BSA -- and hundreds of old British cars at a big show west of Detroit. Simcoe was revisiting part of his Australian youth. As he toured the grounds, a pair of bright red Rovers, an immaculate 1971 2000TC and a clean 1985 2600S SD1, caught and held his attention, taking Simcoe back to his boyhood and triggering memories of his own first car, a stately 1949 Rover 75. Simcoe chatted with the owner of the 2000TC, an engineer. Simcoe recalled in detail the Rover's advanced (for the time) body construction -- all the Rover's exterior panels bolt on -- the car's rear suspension system. He casually dropped the name of the designer, David Bache. Simcoe says the aerodynamically styled SD1 -- a complete break from Rover's past -- caused his dad in 1976 to switch to Holden, a company where less than 10 years later Simcoe would be at work creating some of the brand's most cherished vehicles, including the Holden Monaro and all the Commodores from the 1980s on. Some men in Simcoe's position -- he took over July 1 for the retired Ed Welburn as General Motors head of design -- attend classic car shows as a judge or simply because they love classic automobiles. They need to keep an eye out for interesting shapes, styles and materials that might be worth revisiting. But Simcoe, 58, had another reason for being there: "I love mechanisms. That's the fascination behind motorbikes. I love the functional content of the car, the motor, the transmission. That's just as fascinating to me as the character and proportion of the vehicle." A colleague says: "He's an engineer in a designer's body." GM historian Greg Wallace says Simcoe is likely the most technically oriented design chief the company has ever had. While some of Simcoe's six predecessors certainly had an appreciation for engineering, Wallace says, few if any rolled up their sleeves and got grease under their fingernails. Simcoe's enthusiasm for the technical aspects of automobiles -- he has rebuilt engines and understands body engineering -- is a key reason GM product development chief Mark Reuss and CEO Mary Barra selected him as Welburn's successor. In fact, Simcoe may be the industry's prototype design chief at a time when technology is transforming the automobile and the way it is manufactured. New lightweight materials, self-driving technology and advanced electrified propulsion systems are already disrupting the design and product development process. "You might be leading design or engineering because you are an outstanding leader and you can get the best out of people," Reuss says. "That's important. But it is really unique to be really a good designer and be able to productionize a car design. That is a whole different thing than being a great sketch artist or a concept car designer. That's a rare deal. And he'll be able to do that really well. He's one of the best I've ever seen." Two important products, the next-generation full-size pickups and GM's new global emerging market small car, will test Simcoe in the immediate future. The new trucks, started under Welburn and due around late 2018, are not yet fully baked and might see some changes under Simcoe. The new design chief won't say much about them, except to offer one important clue. "They're incredibly efficient," he says. That likely means the new trucks will have a combination of three things: lower weight, good aerodynamics and a fuel-efficient powertrain. The new pickups will use GM's mixed material manufacturing system now in use on the Cadillac CT6, a system that entails welding, riveting and bonding and aluminum, steel, cast parts and extrusions. It enables a vehicle body to have "the right metal in the right amount in the right places," says Charlie Klein, executive director of global CO2 strategy and energy center engineering. Simcoe's engineering expertise could help reduce development time for vehicles built in that fashion. "We don't specifically have a job in design for lightweighting the structures of vehicles," he says. But, Simcoe says, the design staff does have a role to play in keeping weight off vehicles. He says designers need to reduce clutter by not adding unneeded parts. The $5 billion project for emerging markets kicked off just over a year ago. It will spawn a family of technology-rich small cars to be sold in China, Brazil, India, Mexico and other markets. The project, Reuss says, is another reason the company feels Simcoe is the right man to lead design. "Mike has an incredible depth of experience in different markets around the world," he says. "He's actually been a designer in lots of different places and different markets. And that's really important because our portfolio is big. His knowledge of [global] markets is fresh and deep." 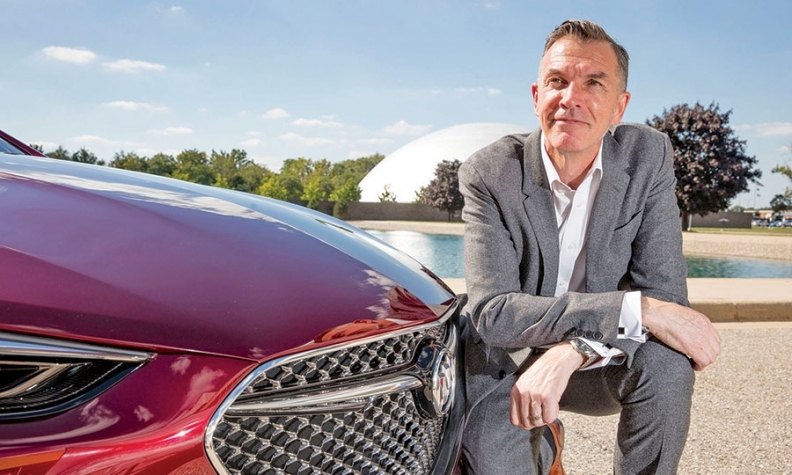 A 33-year GM design veteran, Simcoe has global experience that includes leading GM's Korean styling operations, which is responsible for the vehicles for Asia-Pacific, and stints in Detroit. Simcoe's work is well-known in the U.S. The reborn Camaro, the Pontiac GTO and G8, the Chevrolet SS and the first-generation Cadillac CTS all bear Simcoe's stamp. Simcoe sees part of his role as continuing the work of Welburn, who helped build a global design organization that operates 10 studios in seven countries and employs around 2,500 people on the design staff. "I have a role to take design to the next stage," Simcoe says. "As we introduce autonomous vehicles and we get into electrification in a big way, that's going to change the architectural and proportional value of the cars. ... And that's a new opportunity for design." Car design may be changing as new technologies are adopted, but Simcoe says he won't be spending much time on the boards. "I would be embarrassed to do drawings and hand them to the studio because of the caliber of people we've got," he says. "In my quiet moments I sketch for myself, maybe to think about an idea or for some character of the brands, for instance. I wouldn't go in and put my stamp on a process like that. Because of the position I am in, if I were to walk into a studio with a sketch, people would take that as the voice of God and then do it. I am not about anything more overall than influence; I want to enable people." Simcoe also wants his designers to have a strong grasp of the technical side of designing for manufacturing so that GM can produce higher quality vehicles and do it more quickly. "The technical as well as the style is important," he says. "Designers need to have that, and we'll encourage it," he says. Simcoe probably has two or three product cycles during which to leave his mark on the company. But he says leaving a legacy is not his focus or a priority. "I am thinking about the next 12 months and two years in the business," he says. "I am here to make sure I enable the team we've got -- which is an incredibly creative team -- to be able to do their business not just here but all around the world." 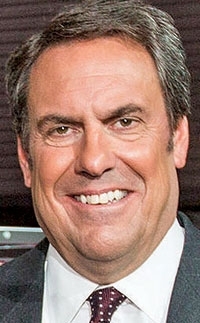 Although he won't have had a major influence on the vehicles GM will launch until about 2019, Simcoe can steer minor changes. "The nice thing about being in this position is that I am the last set of eyes that sees everything. So, if I don't specifically make a call on it, I will have seen it and approved it. So in that respect I will have an influence on everything." Reuss says Simcoe is already making an impact. Welburn let Barra and Reuss know a year in advance that he planned to retire. Reuss started vetting potential candidates, but it didn't take long for him to settle on Simcoe. "We had a lot of time to think about what we wanted to do. I knew a lot of the people really well. You have to look at where you think design needs to be next," Reuss says. Once Reuss and Barra settled on Simcoe, it took a very long distance phone call and some convincing to get him to accept the job and move back to Detroit from Australia. Reuss: "Do you want to do the job?" Simcoe: "If you are looking for someone who's like Ed, I'm not like Ed. I'm very different." Reuss: "I know you are not like Ed. This is not a repeat of Ed. You are not the same people. I've known you for 20-plus years. I know who you are and I know what you can do. That's why I am asking you do to do the job because this is the next step for design." Simcoe: "OK, good. I never thought I would have got the job, but I know what I need to do for the job." Reuss: "Yup. I know you do. Let's go."